“Look,” said my mother as she handed me a tomato. “What is that bizarre growth?” I asked myself, as I looked at it puzzled. “It’s a kitty!” she explained. Magic and wonder are in the eye of the beholder. Can you see it now? p.s. Surely I’ll post some book reviews soon; when I finish Middlemarch and getting my room established for school. Next Post Are You As Sick Of Looking At The Kitty Tomato As I Am? Yes! How interesting that fruit and vegetables can produce such "sights"! Great Ruby Red.Happy Ruby Tuesday,LOLA:)btw Mine this time is HERE. Hope you can join me. I love your new picture in your header. Although I must say I miss the beautiful door. Do you change your header very often? Oh, dear, Kathy. I'm afraid my exploration has only left my readers in confusion. I love the beautiful door as well; I just thought this Renoir would be more fitting for the start of school (where I teach third grade) and a book blog.Knowing me, you'll probably see the door again. Some day. Hilarious. I might be pulling out a few kitty vegetable posts of my own as school gets underway. The stress of it all. Always feel better once I see the kids coming through the door though! Good luck. Thanks for the smile. 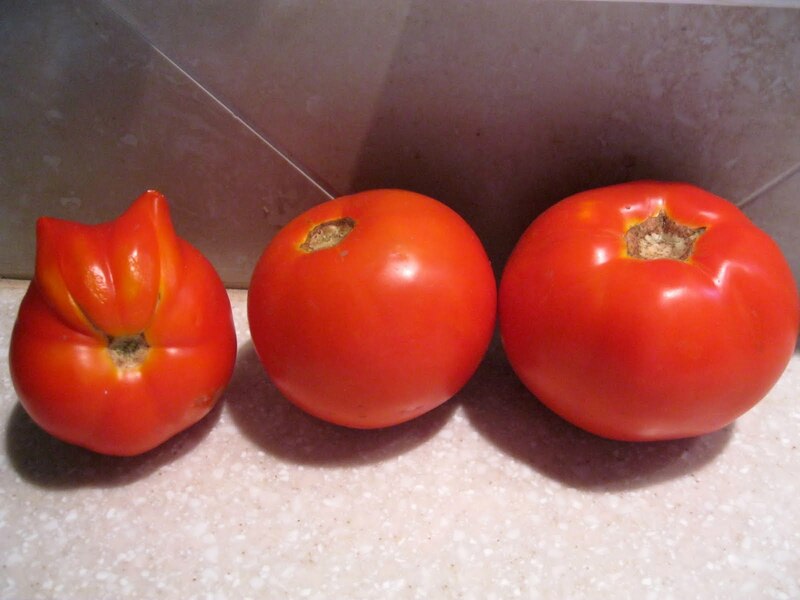 🙂 I like the funny growths often seen on tomatoes and I LOVE your mother's imagination. Is i weird that I saw that before I read the title and or story? Maybe I did subconsciously though..You teach? How wonderful! I always admire people who teach children. I don't think I ever could. LOL, I love it. I hope my tomato plant produces a kitty tomato this year. Or maybe a puppy tomato. It does look like a kitty. :)Happy RT! P.S. I made your peach sorbet Sunday night–triple yum!!! It will be repeated. A gift from the veggie gods! How very fun. I can absolutely see the kitty! How wonderful! Very cute 'mater! I hope it was tasty. I love nothing better than squishy white bread slathered with Hellman's/Best Food's Mayo and thick slices of garden fresh tomatoes. Yum-O!Happy Back-to-School to you, Ms. Bellezza! I love fall and have such a strong desire to go buy a box of pencils and crayons. Now if only the weather would cooperate. 102 today. Actual, not heat index. Sigh. How I miss blogging and you dear Bellezza! How can one feel so busy and yet not that physically harassed?The tomato is lovely. If only they don't rot they would somewhere in my bedroom.